Marrubium vulgare is also known as white horehound or common horehound. This low-growing perennial with fuzzy, deeply veined leaves and rounded heads of small whitish flowers originated in southern Europe and Asia. Now, however, it’s found throughout the world – as a common roadside plant. One of the top-selling medicinal herbs in the USA, marrubium is used mainly in natural cough drops and lozenges to relieve congestion and dry coughs (such as in cases of acute or chronic bronchitis). It’s less commonly used for digestive complaints. This bitter herb is related to the mint family.. The main compound of interest is marrubiin, a substance that gives the plant its bitter taste. Marrubiin appears to stimulate secretion of the bronchial mucosa, so it is considered to be an expectorant. Other constituents include volatile oils (camphene, limonene and others), flavonoids, tannins and phenolic acids. White horehound is used in cough preparations as it eases dry coughs. As a bitter tonic, horehound is also used to treat digestive disorders such as indigestion, dyspepsia, flatulence and lack of appetite. Traditionally, horehound was used to ease menstrual disorders and inflammations of the skin and mucous membranes. The essential oils in horehound help dilate the arteries, increasing circulation to the lungs. Horehound’s extreme bitterness may help liver function. No side-effects have been recorded with prescribed dosages. High doses of white horehound may affect heart function. As high doses may also stimulate uterine contractions, pregnant women are advised not to take products containing marrubium. Always consult your healthcare practitioner before taking marrhubium or any other herbal preparations for health. 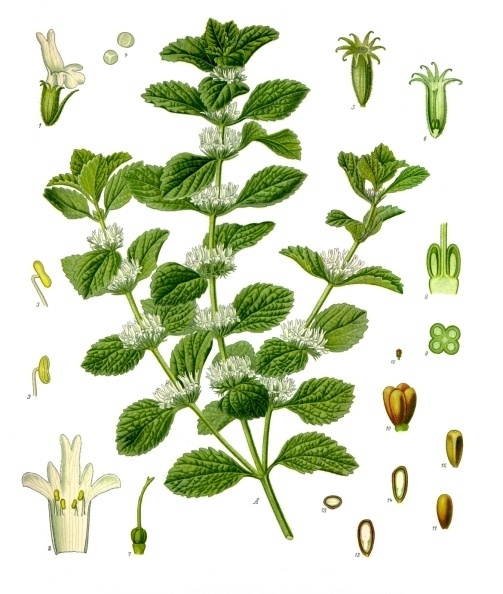 White horehound’s most common use as a food is to make a brew that resembles root beer. White horehound is a hardy perennial. Plant in the garden or a container in full sun. Do not over water. Attracts bees. Infusing a leaf in milk is reputed to be effective as a fly spray.